The “V” attachment was originally established for wear only with the Bronze Star Medal (BSM) in order to address a significant issue that arose after the Bronze Star began to be issued after it was created by President Franklin Roosevelt’s Executive Order 9419. Because the BSM was awarded for heroism in combat as well as for meritorious service and achievements, many Commanders and Soldiers alike felt there should be some way to readily identify BSM recipients who had been honored for heroism and valor while maintaining the award for those whose contributions, though laudable and noteworthy, had not involved valorous acts. Exercising the authority outlined in the Executive Order that had established the BSM, the Navy and War Departments settled on the same solution: a bronze, block-letter “V” (for “Valor”) to be worn on both the service ribbon and the suspension ribbon of the BSM. In the case of the Navy, the “V” attachment was designated as a “Combat Distinguishing Device;” only those who had performed acts or services while exposed to personal hazard due to direct participation in combat operations were authorized to wear the “V” with the BSM. Over the decades, the “V” attachment has been expanded for use with other Personal Military Decorations (PMD) in order to recognize acts of valor that do not rise to the level necessary to justify award of one of the five decorations that solely recognize individual valor (Medal of Honor, Distinguished Service Cross, Navy Cross, Air Force Cross, and Silver Star Medal. In 2016, the Department of Defense changed the regulations regarding what medals qualified for issuance with the “V” attachment, most significantly removing Achievement Medals issued by the Navy, Marine Corps, Air Force, and Coast guard. As of July 2017, the medals that may be issued with the “V” attachment are limited to the Bronze Star Medal, Air Medal, Distinguished Flying Cross, Joint Service Commendation Medal, and Commendation Medals from the four Military branches that fall under control of the Department of Defense (Air Force, Army, Navy, and Marine Corps). 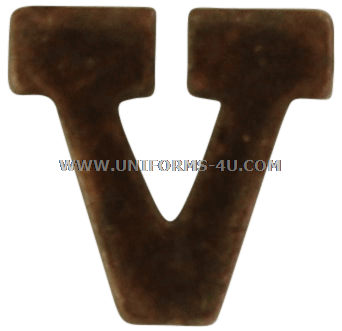 In June 2017, the Air Force announced it would employ a Bronze/Silver/Gold system to denote the first, second, and third awards of the "V" device on a medal, with a wreath added to the differently colored "V" devices to reflect the fourth, fifth, and sixth award of the device. 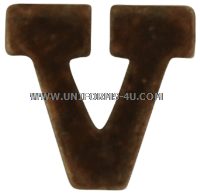 A wreathed bronze "V," for instance, would indicate the wearer had been awarded that medal with the device four times.